The name of the Association is the Virginia Mathematical Association of Two-Year Colleges (VMATYC). 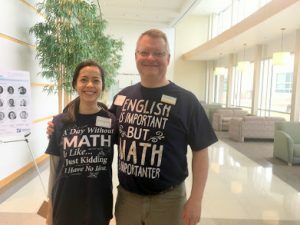 The Virginia Mathematical Association of Two-Year Colleges is a non-profit, educational association. Its purpose is to promote mathematics and mathematics education by (a) encouraging the development of effective mathematics programs, (b) providing a forum for the exchange of ideas, and (c) promoting the professional development and welfare of its members. Any person interested in two-year college mathematics education is eligible for membership. Dues shall be paid by all members at a rate recommended by the Executive Board and approved by the members at the annual business meeting. The officers of the Association are President, President-Elect, Past President, Northern Region Vice-President, Central Region Vice-President, Eastern Region Vice-President, Western Region Vice-President, Membership Secretary, Recording Secretary, Treasurer, Webmaster and AMATYC Affiliate Delegate(s). Collectively, these officers are called the Executive Board. The affairs of the Association are conducted by the Executive Board. Actions taken by the Executive Board may be rescinded by a majority vote of the members present at the annual business meeting. Officers shall serve a two-year term. The Association will have a biannual conference and an annual business meeting. Other Association meetings may be held as determined by the Executive Board. Executive Board meetings may be held as determined by the officers. Officers are elected by members using the procedures outlined in the By-Laws. New officers start their term at the conclusion of the annual business meeting following the election. Committees are created as needed by the Executive Board to carry out the purpose of the Association. These committees are dissolved, when appropriate, by the Executive Board. The rules contained in Robert’s Rules of Order govern all cases to which they are applicable and in which they are not inconsistent with this Constitution or By-Laws. Proposed amendments to this Constitution are initiated by a majority vote of those attending the annual business meeting. Ratification of a proposed amendment is conducted by ballot of all members. A two-thirds vote of approval of the members responding by the deadline stated on the ballot is required for ratification. Ballots will be prepared, distributed, and tallied under the direction of the Executive Board. The Association shall be affiliated with the American Mathematical Association of Two-Year Colleges (AMATYC). The Association may be dissolved only after an amendment of this Constitution has been adopted that provides for the transfer of all unencumbered funds to an organization with similar purposes. The membership year shall be January 1 through December 31. A person becomes a member for the remainder of the membership year upon completing the membership application and paying the required dues. Only members of the Association may vote or hold office. A student membership is available at a reduced fee to a student who is endorsed by a member and who completes the membership application and pays the required dues. Student members are not eligible to vote or to hold office. No VCCS faculty member is eligible for the student membership. Preside at all meetings of the Association, serve as Chair of the Executive Board, and prepare the agenda for all meetings. Perform all other duties that regularly pertain to the office. Appoint a Regional Vice-President to preside in his/her absence from any meeting. Chair the Biannual VMATYC Conference Planning Committee. Promote membership in the association. Coordinate communication among members in that region. Serve as liaison for one of the Association’s committees. Provide items for all issues of the Newsletter each year. Promote membership within the region. Notify members of the expiration of their membership. Keep an up-to-date file and mailing list of members and potential members. Be responsible for the official correspondence of the Association. Keep accurate permanent records of meetings of the Association and the Board. Be responsible for maintaining all financial records and collecting and dispersing all funds of the Association. Make a financial report at each Executive Board meeting. Make an annual report, audited by the Finance Committee, at the annual business meeting. Represent VMATYC at the yearly national AMATYC conference and report to the membership at the annual business meeting. Maintain close contact with the AMATYC Regional Vice President. In the event that the President is unable to complete his/her term in office, the President-Elect will assume the office of President. All other vacant offices will be filled by the Executive Board. The Nominating Committee, chaired by the Past-President, shall consist of four members, one from each region. The Nominating Committee shall solicit nominations from the membership and shall present a slate of nominees with two candidates for each office to the membership. The slate of nominees with a brief biographical sketch of each nominee and information on the voting procedure will be sent to the membership prior to the annual meeting. Ballots are to be completed by the deadline specified on the ballot. The Chair of the Nominating Committee shall tabulate the returned ballots and report the results to the President who will announce the results at the annual business meeting. Anyone desiring nomination for an office shall notify any member of the Nominating Committee in writing and shall present to the committee a brief biographical sketch at least four months prior to the annual meeting. Elections to an office shall be by majority of the ballots returned to the committee. In case of a tie vote for an office, the Chair of the Nominating Committee, in the presence of at least two other members of the Association C neither of whom is a nominee for that office C shall use a fair, random method to determine the election for that office. The number of Affiliate Delegates is determined by the parent organization, AMATYC, and can vary from year to year. In order to determine who will serve, the Affiliate Delegates will be ranked in the following manner during the election of officers: the candidate with the most votes will be designated Affiliate Delegate 1, the candidate with the next highest number of votes will be Affiliate Delegate 2 and so forth. One-fifth of the members of this Association shall be a quorum. In the absence of a quorum no business meeting may be held. One half of the members of the Executive Board shall be a quorum. In the absence of a quorum no Executive Board meeting may be held. Amendments to the By-Laws may be proposed by a majority vote of the attendees at the annual business meeting. The proposed changes become part of the By-Laws by the affirmative vote of a simple majority of members responding to a ballot. Ballots will be prepared, distributed, and tallied by the Executive Board. Function: Plan and execute the biannual conference. Members: President-Elect (Chair), a local facilities coordinator, and others as appointed by the Executive Board. Function: Perform an annual financial audit of the Treasurer’s annual report and serve as financial advisor to the Association. Members: Appointed by the Executive Board. Board, for awarding any scholarships and to select recipients using the determined criteria. Members: Past-President (non-voting Chair) and one member from each of the four regions as appointed by the Executive Board. Function: In odd calendar years, provide a slate of nominees for officers of the Association in accordance with Article 3 of the By-Laws. Members: Past-President (Chair) and one member from each of the four regions as appointed by the Executive Board.